When heaven above falls silent, God still speaks, and often right next to you. If you’ve ever been burned by a friend when you were down, you might be tempted to adopt the theme song Won’t Get Fooled Again. You divulged a personal secret to a trusted confidant and he or she smothered you with negative replies. People say painful, thoughtless things. They judge mercilessly. They’re presumptive. Fine, you think, Who needs them anyway? Beware, though, of thinking everyone is full of bologna. Often enough in your moment of need, someone shows up for you with a spot-on perspective. It may not be delivered in the mannered style you’d prefer, but it is so accurate God Himself might as well be saying it to you. Job found this out. After three friends gave him the beat-down, a fourth showed up, named Elihu. Rather than engage in character assassination with the other three, Elihu told Job, “Bear with me a little…for I have yet something to say on God’s behalf” (36:2). I’ll admit every religious person thinks they speak on God’s behalf, like the old lines “God told me to tell you…” or “Concerning your situation, I feel from the Lord…”. They’ll bolster their views with hand-me-down religious sayings, an unwieldy stack of personal opinion, and their ace card—a miracle or two that sound more imaginative than real. 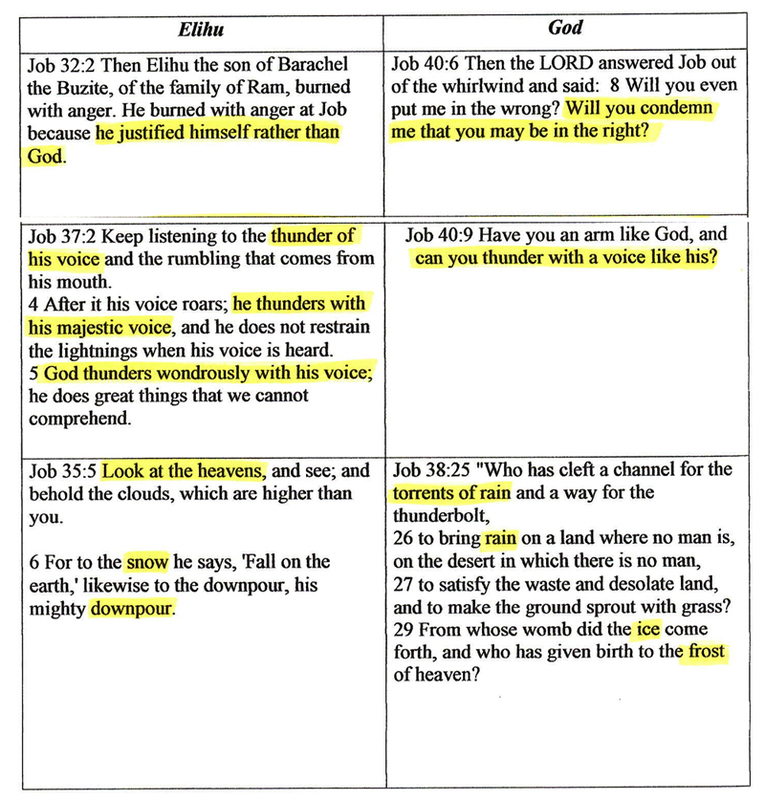 Unlike these, Elihu introduces the source of his views as being “the spirit in man” (32:8), and connects it to “the breath of the Almighty.” In essence, this makes him a lightning rod. Elihu says, “I am full of words; the spirit within constrains me. Behold, my belly is like wine that has no vent; like new wineskins ready to burst. I must speak that I may find relief; I must open my lips and answer” (32:18-20). Something was going on in this man. He was giving voice to the Holy Spirit, and in many respects delivered advance notice to Job of what God would say if He Himself were to show up. Of course at this point in the book, a supernatural manifestation of the Lord is unlikely. None of the five men expect it to happen. Yet in another six chapters God will do precisely that thing, transforming this conversation into one of the most famous debates in history—a religious argument with a divinely decided verdict. And so the question will hang in the air for a bit. What will God say? Which of the four friends will He sound like when He at last speaks? To the layman’s ear, to the non-seeker, and to the spiritually dull, every theological opinion sounds equal. But when God appears in the whirlwind (Job 38), the poseur will be exposed. It will also become clear who actually was speaking on His behalf. Take a look at the following chart. You’ll see a representative selection of key points where Elihu speaks a little and God expands on it. In others, where Elihu speaks a lot and God condenses it. God doesn’t commend Elihu by name, but it can’t be denied there’s a shared kernel of revelation between Him and the man. Nor can we ignore the fact that God rebukes Job’s lack of understanding and shortness of vision, as well as the earlier three friends who are so lacking in spiritual insight. But as for Elihu, there is no such rebuke. The Almighty silently accepts his witness. Elihu seems to have functioned as an extension of God’s mouth—imperfectly no doubt, but satisfactorily. This book doesn’t teach how to discern between fake religious speaking and authentic spirituality. It’s enough for the moment to simply acknowledge that “lightning rods” are out there—people who bring the presence of God into situations. 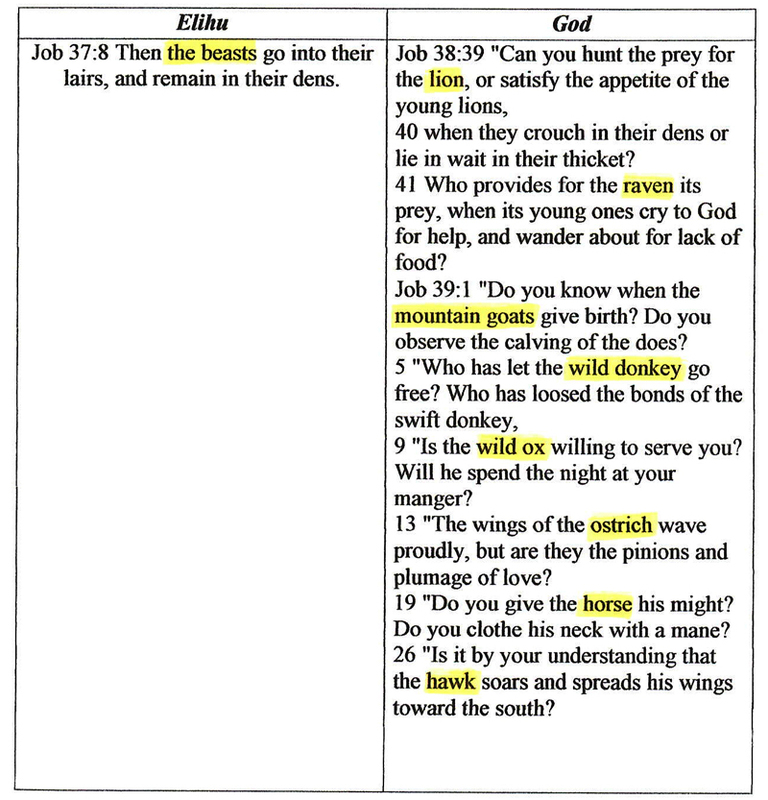 These individuals typically don’t wear the “prophet” or “teacher” label. They’re not always religious celebrities. More than likely they’re simple godly folk with a faithful walk in Christ. Jesus says you can know authentic prophets by their fruit. If their lifestyle and values collide with God’s stated truth, watch out. You’re about to be fooled by a knock-off. And obviously if their teachings contradict scripture, you’ll want to tune out as well. Though friends who are true lightning rods won’t be abusive, don’t expect them to always tell you what you want to hear, either. These people don’t rate popularity as a must-have. In fact, like Elihu, once they briefly serve their purpose, they’re happy to step out of the limelight, even disappear. Don’t develop a cynical spirit and let it short-circuit the wonder of hearing God speak through another person. Just when you need it, when the silence is too great, or the pain too confusing, lightning shows up. I can only add “AMEN” to that. Hmmmm….you already know my opinion on the lad but I am truly grateful for another perspective on Elihu well worth considering. I have found that my own personal “lightning rods”, the ones that draw real voltage from above, usually run in the Sesame Street crowd. However, they tend to lack the “self awareness” exhibited in Elihu. The other so-called “lightning rods”, like Job’s other “friends”, are more like the fuses on a dud firecracker, i.e. they sizzle, smoke and throw off sparks and then….nothing, nada, zip, zero and zilch. Anticipation followed by deflation and disappointment. Hi Don, I agree about the “self-awareness” thing with Elihu. Makes it hard to listen to guys like that. I guess if anything, it shows how much God is still willing to work through fellows with flaws–good news for all of us hoping to serve. Not so good news if you happen to be on the receiving end.